In a large pot, bring the beets, onions, salt, celery seed, pepper, broth and water to a boil. Boil for 1 hour. Add the sugar and lemon juice and simmer for 1/2 hour. Remove the beets and grate half. Reserve the other half for another use. Pour the liquid into a large measuring cup. Beat the egg until very fluffy in a large bowl. Add about 1/4 cup of the liquid and beat, continue adding the soup in a slow stream to the egg, whisking continuously. Stir in the grated beets. Chill at least 4 hours or overnight. Ladle into bowls and top with a dollop of sour cream and a sprinkle of cucumber. Labor Day may have come and gone but here in Baltimore it stays pretty hot and humid until about October which leaves me a few more weeks to experiment with hot weather food before turning to roasts. Chilled soups normally leave me cold but I really enjoyed this one. It had the perfect texture, not too chunky but not totally smooth either, the sour cream added a creamy note and the cucumber the right amount of crunch. I am glad I added some celery seed to the mix, it added just a hint of bright, fresh flavor and gave the soup a great depth. 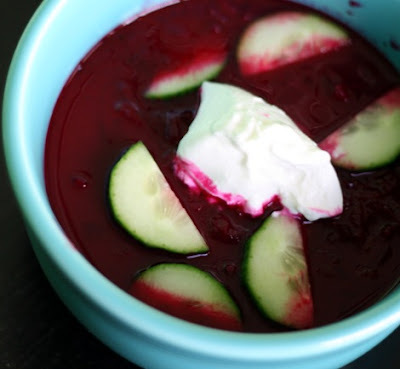 Perfectly refreshing on a hot day-the best borscht I've ever had.